"Hidden Gem" ,9" x 12", Oil on Panel. This original oil painting has SOLD! However, prints are available. The story behind this "Hidden Gem"
We live in the country and so I often get a view of the mountains and countryside when I take my dogs for a walk and this view always caught my eye. 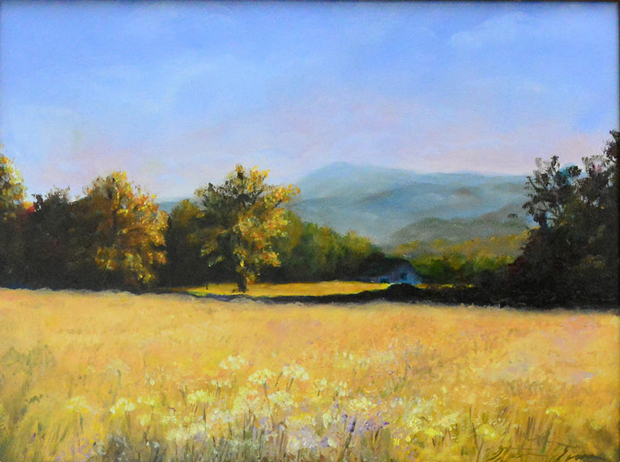 Nestled in the field of yellow, with the protective mountains in the background, sits a rundown barn. We've lived in Huntsville, AL since 2005 and we've watched this city grow and since, this barn has since been fixed up and there is even a nice house sitting to the right of it now. If you have a picture you'd like to have turned into a painting, please contact me stephanie@grinninglikeanidiot.com. Thanks for following along with my artwork, crafts and other fun stuff! "Bird Waiting For Spring" Dry Brush Oil 11 x 14"